All glories to His Divine Grace A.C. Bhaktivedanta Swami Prabhupada. He is always accompanied by his associate servitors, his internal nature is just like the sweetest nectar and externally he appears like fearlessness personified. I continually offer my full prostrate obeisances unto the dust of his lotus feet that are the all auspicious shelter and goal of my life. 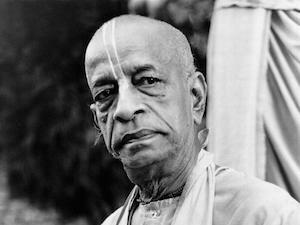 The blissful service of the lotus feet of Srila Prabhupada is glorified by the topmost saints and devotees. To obtain the unalloyed service of his lotus feet is the only cherishable goal of my life. That eternal desire is always being fulfilled by the nectar of His Divine Grace and therefore the beauty of his unlimited transcendental qualities continually charms my heart. Now my dear devotees please hear with great care and attention the narration of Srila Prabhupada-Lila-Smarana-Mangala-Stotram, the transcendental qualities and pastimes of His Divine Grace, the topmost servant of Srimati Radharani. On this auspicious day you must incarnate on the earth along with my blessings and spread Krsna consciousness in every town and village of the world. My very dear Sri Kamala (another name of Srila Bhaktivinoda Thakura) has already announced your coming and she has also predicted your devotional service unto My Lord Gauranga. That unalloyed servant of Sri Krsna (later to be known as A.C. Bhaktivedanta Swami Prabhupada), who's heart was filled with the most inconceivable love of Godhead, paying obeisances and offering countless prayers at the lotus feet of the Supremely Worshipable Goddess of Fortune then appeared on the earth in the renowned Vaisnava family, headed by Sri Gaura-mohana. Afterwards, at an auspicious moment arranged by the grace of Srimati Radharani, Srila Prabhupada met his spiritual master (Srila Bhaktisiddhanta Sarasvati Thakura). He saw the divine grace of Srimati Radharani in his Gurudeva and understood him to be an effulgent ray of Visnu, His Divine Grace personified. That great divine master Sri Varsabhanavi Devi Dayita Dasa (another name of Srila Bhaktisiddhanta Sarasvati Thakura, meaning the servant of the lover of Sri Radha) who is expert at practicing pure devotional principles and who is a fearless preacher of the Divine Message of Godhead now conferred upon Srila Prabhupada the name Abhaya Caranaravinda according to his own firm self-confident character. The meaning of that name is that he is the servitor of the lotus feet of the Supreme Personality of Godhead which are the abode of all fearlessness and hopes for the pure devotees. By singing and preaching with great loving devotion that sublime message of his Gurudeva, which is pure devotional knowledge of the Rupa-Sarasvati (Rupanuga) stream, His Divine Grace has shown to the world that all good fortune manifests from adherent devotional service unto the lotus feet of Sri Guru. In the temple of Sri Jiva Gosvami, namely Sri Sri Radha-Damodara Mandira and Sri Rupa’s samadhi, in his rooms given by his divine masters, His Divine Grace performed his bhajana in the loving devotional mood of the vraja-gopis. His Divine Grace lives eternally in his place of bhajana as the precious gem among the pure devotees where the loving devotional service of Srimati Radharani constantly blooms personifying the beauty of divine ecstatic mellows. Leaving behind the sacred land of Vrndavana and taking a great risk in his old age, His Divine Grace came to the western world as our Ever Well Wisher carrying with him the message of gaura-prema, love of Lord Gauranga. Upon his arrival he earnestly prayed to Lord Krsna addressing Him as ‘bhai’ (O Brother) in an intense loving way. “O dear brother, my dear and intimate friend! I tell You this in a most definite way. You can achieve some invaluable merits by pleasing Srimati Radharani. You (Lord Krsna) can really attain even more fortune if You can now please Her, the Supreme Goddess of all good fortunes. Srimati Radharani Herself in the form of Srila Bhaktisiddhanta Sarasvati Thakura ordered me to preach Her message. Therefore please take my word and advice and fulfill Her desire; then only can I attain success and serve my guru fully. The mine of incomparable good fortune is the message of His Divine Grace: “If someone takes shelter of krsna-nama, and Lord Caitanya Mahaprabhu, the son of mother Saci, along with their dear associates, Sri Svarupa-damodara, Sanatana Gosvami, and Sri Rupa Gosvami: They being greatly pleased with such a person bestow upon him entrance into the embrace of the dear associate servitors of Srimati Radharani at Govardhana, Vrndavana, and sometimes at Sri Radha-kunda; blessing them with the supreme fulfillment of the ultimate goal of krsna-prema. Completing his missionary activities in the western world Srila Prabhupada returned to Vrndavana. Accepting the month of Karttika, which is non-different from Srimati Radharani, bearing Giriraja Govardhana in mind and embracing the lotus feet of his most worshipful Lord in the core of his heart he made his disappearance from this world and entered the nitya-lila, the eternal loving pastimes of Goloka where Lord Govinda is always effulgently present with His Dearmost Srimati Radharani. By showing us his disappearance from this world in the month of Karttika and by revealing his desire to go to Govardhana Hill he has thus shown us the path which leads to the fulfillment of the ultimate aim and object of life, that is to obtain supreme shelter in the camp of Srimati Radharani's associate-servants with humble self surrender, residing always at Sri Govardhana. When will that day be mine, in some distant lifetime, when the beauty of His Divine Grace's transcendental life, possessed by the qualities of pure love for Sri Sri Radha-Krsna actually become my only wealth giving me a taste of the highest happiness? O when will that day be mine? Let us always pray to remain the humble and obedient servants of His Divine Grace. With a burning heart, filled with an intense longing for his association, this poor and lowly insignificant beggar humbly prays for that fortunate day when the life of his servant will be empowered by His Divine Grace with firm determination so that I may with one pointedness, not caring for anything else, constantly sing with my body and mind the sweetest glories of Srila Prabhupada’s unlimited transcendental qualities and pastimes. Let me offer my most respectful and humble obeisances to the lotus feet of my spiritual master His Divine Grace Sri Jagat-guru Om Visnupada Paramahamsa Sri Srimad A. C. Bhaktivedanta Swami Prabhupada. Let me also offer my most respectful and humble obeisances to all of Srila Prabhupada's eternal servants, paraphernalia, and pastimes. By the boundless mercy of His Divine Grace, vast numbers of conditioned souls are being drawn to the lotus feet of Sri Caitanya Mahaprabhu and Sri Sri Radha-Govinda. I humbly bow my head in the dust of the lotus feet of Srila Prabhupada and sincerely pray that he will accept me as one of his eternal servitor associates. The disciples of Srila Prabhupada worship His Divine Grace as the dearmost servant of Srimati Radharani in the line of Sri Rupa Gosvami. I must therefore beg forgiveness at the lotus feet of Srila Prabhupada and before all of you, the listeners and readers, for any fault or offense that I have committed in my attempt to glorify His Divine Grace. If I have committed any offense when dealing with so many subtle and exalted things about the great personalities, please, Nityananda Prabhu, absolve me of that offense and restore me to my normal position. We shall always remember Srila Prabhupada, our eternal father, as the empowered representative of the most glorious and beautiful queen of Sri Vrndavana, Srimati Radharani, and we shall forever aspire for the shelter of his lotus feet. What follows are eight transcendental remembrances of His Divine Grace A. C. Bhaktivedanta Swami Prabhupada's manifest pastimes in Sri Caitanyadeva's ongoing sankirtana-lila, all of which point to his eternal service in the camp of Sri Radha. It was Nandotsava, the day after Janmastami, the advent day of Lord Krsna, when Srila Prabhupada appeared in this world in a small village on the outskirts of Calcutta. It was a very auspicious day and all the people in the three worlds were engaged in a wonderful festival celebrating the birth of Sri Krsna-candra, who had advented at Sri Vrndavana-dhama almost five thousand years before. At this auspicious time, Srimati Radharani, the queen of Vrndavana, called her dear servant and said, “Please go to earth and give them Krsna's mercy.” Thus her own servant was sent to this world to spread Krsna consciousness in every town and village. Who else but the dearmost servant of Srimati Radharani could be worthy of such a task? That Thakura Bhaktivinoda's first publication came to the West in the same year that Srila Prabhupada appeared in this world as ‘the ambassador to fulfill the prediction of Sri Caitanya Mahaprabhu’ is felt in the hearts of Srila Prabhupada's eternal servants as an eternal transcendental truth. Srila Prabhupada is always situated in eternal pastimes of the divine couple Sri Sri Radha-Govinda in the transcendental realm of Goloka Vrndavana. 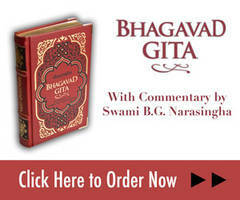 Thus the place of Srila Prabhupada's appearance in this mundane world is considered non-different from Goloka Vrndavana. Let us therefore eternally worship the auspicious day and the auspicious place where Srila Prabhupada manifest his humble appearance in this world. Srila Prabhupada's father made all these arrangements: mrdanga lessons and Deities of Radha-Govinda for Srila Prabhupada's childhood worship. In due course of time, everything became wonderfully manifest in Srila Prabhupada, as per his father's transcendental desires. What wonderful arrangements the Lord makes for his pure devotees. Let the holy remembrance of Sri Gaura-Mohana De, the father of Srila Prabhupada and a pure devotee of Krsna, be ever present in our thoughts. Let the transcendental memory of Srila Prabhupada as the eternal servant of the servant of Sri Sri Radha-Govinda become our exclusive meditation and bhajana. Srila Prabhupada often spoke about the instructions of his Guru Maharaja to preach and publish Krsna conscious literature. Srila Prabhupada was especially fond of mentioning the story of how he received his most important instructions from Srila Bhaktisiddhanta Sarasvati Thakura at Sri Radha-kunda. Srila Prabhupada recalled that at the time Srila Bhaktisiddhanta was feeling some dissatisfaction in regard to some disciples competing over who would live in which rooms in the newly constructed temple in Calcutta. In great humility Srila Prabhupada used to say that his only qualification was that he had firm faith, guru-nistha, in the order of his spiritual master. The ultimate conception of the spiritual master in the Gaudiya sampradaya is that the guru is the representative of Srimati Radharani. Srila Prabhupada saw his Guru Maharaja, Srila Bhaktisiddhanta Sarasvati Thakura, in that way and that is the standard that we are to adopt if we are to enter deeply within the ocean of Krsna consciousness. Let us always worship the holiest of holy places, Sri Radha-kunda, and let us always remember the instructions of Srimati Radharani to her most confidential servant at that most holy place. Once in Vrndavana Srila Prabhupada informed a small group of his devotees of something very sublime, “I live eternally in my rooms at the Radha-Damodara temple.” The real substance of this statement is of course only fully known to Srila Prabhupada himself, but we can feel with our heart that this clearly indicates that Srila Prabhupada is an eternal member of the camp of Srila Rupa Gosvami. In his small rooms overlooking the samadhi of Srila Rupa Gosvami, Srila Prabhupada used to execute his daily bhajana of chanting the holy name of Krsna and writing the Bhaktivedanta purports in Srimad Bhagavatam. Srila Prabhupada also informed us that, “I got inspiration for going to the West simply by performing my bhajana and praying before the samadhi of Srila Rupa Gosvami.” There he did his bhajana and there he daily sang Narottama Dasa Thakura's song, Sri Rupa Manjari Pada. It is in this song that we find the highest aspiration of the followers of the Rupanuga sampradaya in the service of Sri Radha. The Radha-Damodara temple is located within the rasa-mandala of Sri Vrndavana-dhama and it occupies a most exalted position as the place of highly confidential lila of Sri Sri Radha-Govinda. It was here also that the renowned devotee Srila Jiva Gosvami prepared transcendental literature on the science of Krsna-consciousness. Damodara generally means bound by the ropes of love of Mother Yasoda. But there is another meaning of Damodara which is known only to the followers of Sri Caitanya Mahaprabhu. Damodara means bound by the love and affection of Srimati Radharani. So great is Srimati Radharani's love for Krsna that she has captured Krsna and bound her Lord making him Her exclusive property and servitor. The Radha-Damodara temple now stands at that place where Lord Krsna became a slave to the love of Srimati Radharani, where he bowed to her holy feet in radha-pada-seva, and this also is the eternal place of service and bhajana of Srila Prabhupada. Let us always remember the Radha-Damodara temple, the place of holy bhajana of Srila Prabhupada and let us never forget his most exalted position as a servant of Srimati Radharani in the camp of Srila Rupa Gosvami. When the good ship Jaladuta was crossing the Atlantic Ocean en route to Boston Harbor on Sept. 13, 1965, Srila Prabhupada composed a beautiful prayer in his native Bengali language. The refrain appeals to Sri Krsna, who is bound by Radharani's love. It is the desire of Srimati Radharani to spread Krsna-consciousness all over the world and it is the desire of Sri Krsna to spread the glories of Srimati Radharani amongst the surrendered souls. Both these elements are present in the very beginning of Srila Prabhupada’s attempt to start the Krsna-consciousness movement in the Western world. Once Srila Prabhupada commented that, “Krsna alone is not so beautiful.” The meaning is that without Srimati Radharani by his side Krsna is incomplete. The ultimate truth is that Radha and Krsna are together eternally-they actually never separate even for a moment. As Krsna never takes even a step out of Vrndavana, similarly Krsna never leaves the side or Srimati Radharani even for a moment. The two are eternally united. The pure devotees of Krsna never desire to enjoy separately with Krsna-rather they eternally desire to serve the divine couple Sri Sri Radha-Krsna by attending to all their needs or transcendental necessities. Let us always remember the lotus feet of our divine master, His Divine Grace, who has obtained the greatest fortune from the Supreme Lord Krsna by the grace of Srimati Radharani and who is eternally engaged in their most intimate service. The matchless gift that His Divine Grace so graciously gave to his disciples, followers, and ultimately the whole world is nicely expressed by Srila Raghunatha Dasa Gosvami in the following prayer to his spiritual master. What we find expressed here by Srila Raghunatha Dasa Gosvami is truly the essence of the mission of His Divine Grace and the most refined understanding of the substance of our Gaudiya sampradaya. Here Dasa Gosvami prays to his Gurudeva, and if we can understand the things represented in this verse, we can say that we have understood Srila Prabhupada’s message. By the grace of His Divine Grace, we have received the highest conception of the Holy Name of Krsna and the shelter of Sri Caitanya. Sri Caitanya's personal secretary, Svarupa-damodara, is none other than Sri Lalita Sakhi, the closest friend of Sri Radha, who canvasses widely on her behalf. By Srila Prabhupada’s grace, we have come to her shelter and also the shelter of Sri Rupa and Sanatana Gosvamis. By their grace we can become acquainted with our eternal place of service at Govardhana and sometimes be called to Radha-kunda in the service of Sri Sri Radha-Madhava. Let us always remember the lotus feet of His Divine Grace, who is the giver of the matchless gift of eternal joy in the hearts of his surrendered servants and who is a torchlight of inspiration to all the members of the Gaudiya sampradaya in the matter of spreading Krsna-consciousness all over the world. After preaching Krsna consciousness around the world fifteen times in only twelve years, His Divine Grace lastly returned to Sri Vrndavana-dhama where he manifest his final pastimes before our eyes and gave us his last instructions. His Divine Grace showed us many things by his personal example and inspired us to continue preaching this Krsna-consciousness movement all over the world. Then in the month of Karttika a few days before Govardhana-puja, His Divine Grace suddenly manifest a great desire to go to Govardhana Hill. It came almost as a shock to the devotees who could not tolerate the idea that His Divine Grace might make such an arduous journey. Then with the help of Krsna Dasa Babaji Maharaja, Srila Prabhupadas desire was relaxed, at least from the external point of view. What was it that His Divine Grace was teaching us or what did he actually express by telling us that he wanted to go to Govardhana Hill? It was not simply Govardhana Hill that can be reached by either car or bullock cart to which His Divine Grace desired to go, but it was the infinite play of his eternal Lord in the service of Sri Radha at Govardhana to which he desired to return. As Dasa Gosvami realized when Sri Caitanya gave him the govardhana-sila and gunja-mala, “Mahaprabhu has given me a place at Govardhana in the service of Sri Radhika,” so His Divine Grace instructed us about these truths through his disappearance. Karttika is the most revered time of year in Vrndavana because it represents the month of Srimati Radharani, and Sri Govardhana Hill is the place of unlimited eternal, intimate pastimes of the Divine Couple Sri Sri Radha-Govinda. His Divine Grace was being called to return to those wonderful pastimes of divine love. The days and moments past and the devotees stood by helplessly--then suddenly the only meaning in our poor lives disappeared from our sight. Our most beloved guide, master, father, and friend had returned to the side of his most worshipful Lord – simultaneously, he had entered our hearts forever. The devotees shed an ocean of tears, yet to this day we have not extinguished the fire of separation felt for his affectionate and reassuring presence. How shall we maintain our lives now? His Divine Grace expressed his inner desire to go to Govardhana Hill and he chose the time of Karttika, the month of Srimati Radharani, for his departure from this world. Thus he has shown us the way and he has drawn the whole world to Govardhana Hill and the Karttika festival. This we have understood by our practical experience, as yearly thousands of devotees from all over the world celebrate Karttika in Vrndavana and circumambulate Govardhana Hill. Let us always remember our Divine Master, His Divine Grace, as an eternal servant and resident of the eternal pastimes of Sri Sri Radha-Govinda and let us carry the impression of his lotus feet and his instructions in the core of our hearts and continue on, as he so strongly desired, to become pure devotees and to spread the Krsna-consciousness movement to every corner of the world. Everything is possible by the will of Radha and Krsna, and His Divine Grace is also always present before us. His Divine Grace has given us the assurance and blessing that through his instructions he will be by our side at every moment. May we all be blessed with his everlasting memory and his transcendental association via faith, surrender, and transcendental loving service.